International Journal of Research in Medicine [IJORIM] is an online open-access peer reviewed publication which focuses on research in the field of medical and paramedical sciences including health care in worldwide. The journal encourages articles on original research, case studies and reviews on topic of current interest. The Journal is published quarterly adopting the continuous publication model and submission is open to researchers in the field of medical and paramedical sciences across the globe. All papers are subjected to screening by the Editorial Board followed by a blinded peer-review by experts in the field. Authors are advised to read our editorial policies to understand our review process. All papers are accepted subject to editorial changes. The articles of journal does not levy any fees and can be accessed on the web free by the global community. The journal does not charge for submission of article. However the journal charges nominal fees for processing and publication of manuscripts including colour reproduction of photographs (if requested). Author Instruction Copy right Form Word Format Pdf Format Author Instruction International Journal of Research in Medicine [IJORIM] is an online open-access peer reviewed publication which focuses on research in the field of medical and paramedical sciences including health care in worldwide. The journal encourages articles on original research, case studies and reviews on topic of current interest. 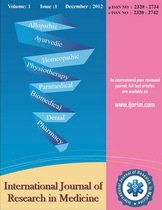 The scope of the journal allows publication of : 1. Original research, 2. Review articles, 3. Case studies/Reports The Journal is published quarterly adopting the continuous publication model and submission is open to researchers in the field of medical and paramedical sciences across the globe. All papers are subjected to screening by the Editorial Board followed by a blinded peer-review by experts in the field. Authors are advised to read our editorial policies to understand our review process. All papers are accepted subject to editorial changes. The articles of journal does not levy any fees and can be accessed on the web free by the global community. The journal does not charge for submission of article. However the journal charges nominal fees for processing and publication of manuscripts including colour reproduction of photographs (if requested). Preparation of Manuscript : The manuscript submitted to the Journal is considered not submitted elsewhere or under consideration for publication in other Journals. 1) Conception and design or acquisition of data or analysis and interpretation of data. 2) Drafting the article or revising it critically for important intellectual content. Articles of original research are welcome in this category. Articles should not exceed 4000 words. It must include an abstract of 250 words. Maximum of 6 keywords to be mentioned at the bottom of the abstract. The manuscript should be prepared in following sequence as title page, abstract and keywords, introduction, materials and methods including statistical analysis, results, discussion, acknowledgement, references, tables and figures. Each of the above mentioned should begin in a fresh page. (i) Title of the manuscript. (ii) The initials followed by the name of each author and highest academic qualification. (iii) The name of the department(s) and institution(s) to which authors are affiliated. (iv) The name, address, contact number and email of the corresponding author to whom queries and proofs should be sent. It should be written for the readership of both clinicians and basic investigators and should state the hypothesis or central question of the study or investigation, the study subjects or experimental animals, observational and analytical methods, the main findings, and a final statement of the principal conclusions. Three to six key words should be used. The relevant statistical methods used for analysis should be briefly explained mentioning the objective of each statistical test in relation to the variables in the reported study that is meaningful. When �p� value is mentioned the exact number should be mentioned [exception is a highly significant value which may be mentioned as [0.001]. Mention should be made about the predetermined level of �p� value which will be considered significant. Details of the statistical software used and its version needs mention. This section should not include materials suitable for inclusion in �Material and Methods� or �Discussion�. The results should be presented in logical sequence in the text, tables and illustrations. The data presented in the tables or figures should not be repeated in the text. Only important and significant observations should be included. This should be limited to significance of results obtained and what can and what cannot be concluded and why. It should not be a repetition of the findings already given under �Results�. Results should be discussed in the light of similar work in the field. Speculative and purely theoretical discussion to which results presented are not related will not be accepted. Acknowledgement should be brief and made specific for scientific/technical assistance and financial supports in the form of grants/drugs/ equipment only. 2. Pugia MJ, Sammer R, Corey P, Lott JA, Anderson L, Gleason S, The uristatin dipstick is useful in distinguishing upper respiratory from urinary tract infections. Clin Chim Acta 2004;341: 73-81. 1. Rose ME, Huerbin MB, Melick J, Marion DW, PalmerAM, Schiding JK, et al. Regulation of interstitial excitatory amino acid concentrations after cortical contusion injury. Brain Res 2002; 935 (1-2): 40-46. 1. Christensen S, Oppacher F. An analysis of Koza�s computational effort statistic for genetic programming. EuroGP 2002: 5th European Conference on Genetic Programming; 2002 Apr 3-5; Kinsdale Ireland. Correctness of the reference list is the entire responsibility of the author (s). (i) Figures (not more than 4) may be submitted in a digital file, preferable in JPEG format. (ii) Figures should be labeled appropriately using arrows [black, white, single or double] which should be mentioned and explained in the legend. (iii) All Figures must be numbered and cited in the text. (iv) Legends should be provided for each figure , listed on a separate page. (v) Figures reproduced from previously published journal articles, textbooks or websites should accompany details of permission obtained from the respective copyright owner. (i) Each table should be typed double-spaced on a separate sheet. (ii) The total number of tables should be not more than 5. (iii) They should have an underlined title followed by a legend, if any. (i) In an unstructured format not more than 250 words. 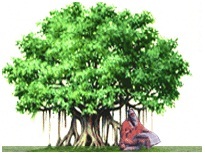 (ii) It should describe the background and summary of the discussion related to the topic of interest. (iii) Minimum of three keywords to be mentioned at the bottom of the abstract. Topic being reviewed in the article should be extensively researched and it should be arranged in a logical manner with relevant subheadings. Illustrations, flow charts and tables should be used to explain the text. It should conclude with a brief statement on current opinion on the topic of discussion and future of the same. A hypothesis for future research may also be generated. Title page, acknowledgement, references, tables and figures should be prepared as per instructions already mentioned under guidelines for original article. Thoughtful discussions of recent original research or recent advances are welcome in this category. Should be no more than 500-1500 words, any tables or figures and references to a maximum of 10. The manuscript should be prepared as title page, abstract of 150 words with 3 keyword terms, text of the manuscript which may be self styled followed by references. Case series may be submitted as original article. 1. Author declaration and competing interest form. 2. Patient consent form, when applicable. 3. Ethics committee approval copy, when applicable. Each Manuscript received by the journal is assigned a manuscript number. The author is expected to mention the respective manuscript number in all relevant communications. Editorial decision will be conveyed to the corresponding author within 4 weeks from the date of submission. Submission of our Copyright form duly signed by all authors of the manuscript and manuscript should be e-mailed.